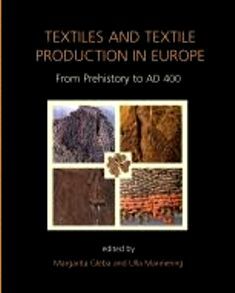 Stark Hollow Farm is featured in Textiles & Textile Production in Europe from Prehistory to 400AD, a recently published book by editors Margarita Gleba & Ulla Mannering. Margarita is an archeologist who specializes in ancient textiles and used a photo of our Icelandic sheep as an example of an ancient breed in her most recently published work. She lectures internationally and will be using samples of our wool and photos of our sheep on her lecture tours. We visited with Margarita in London last summer in the lab at University College of London. We got to look at the enhanced images via electron microscope of ancient sheep fibers from digs in parts of Western Europe. It has been exciting to speak with her about the Icelandic breed and the wonderful fibers that these animals produce. We hope she will visit the farm soon on one of her lecture tours in the U.S.
Winter is a time of building, repairing, and preparing. The chores become simplified: feed, water, clean bedding. The real work happens on the drafting table, in the workshop and in budgeting and planning. A brooder for the 25 chicks that arrive this week is underway. Wood products have been sourced for that and additional panels for the sheep shelter, which will be used for lambing jugs, as well as a new shelter for the six Tamworth piglets that arrive in March. Lambing season starts March 15th and we expect approximately 35-40 lambs. Planning for the processing, packaging and marketing of rabbits will begin soon. 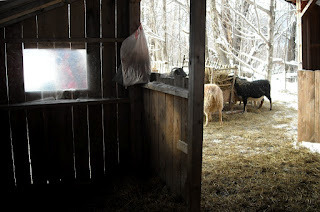 As the days get longer and the new season is born out of the dark of winter, life will abound on the farm. But right now, the earth still sleeps, the sheep bleat and we stay cozy warm by the fire. 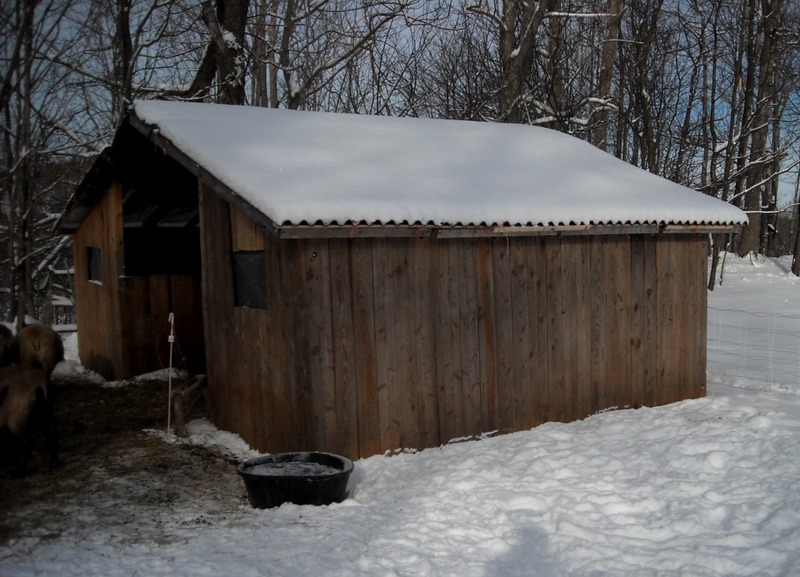 Vanessa's custom designed livestock shelters are modular and may be taken apart and moved. No tools required! 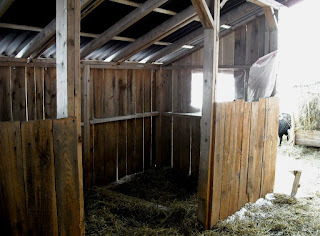 Panels maybe be added or removed to accommodate smaller or larger quantities of animals. The roof system utilizes a durable panel system that will stand up to the winds and snow loads we get here in the north east. The hemlock boards were sourced from a local mill the next town over. The whole system is designed to have a removable floor and can be compartmentalized inside with simple gate style panels to create smaller pens. We use this shelter for overwintering of our flock of 25 Icelandic sheep. 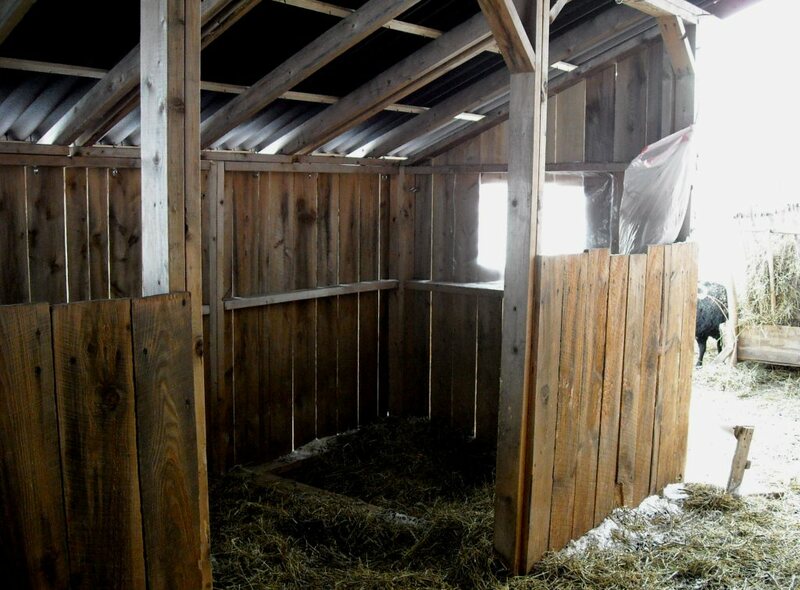 In the spring, several panels will be added to extend the shelter to accommodate lambing jugs. Ewes will spend approximately 2-3 days bonding with and caring for their lambs after birth before they are turned back out on pasture to make way for the ewe mom.